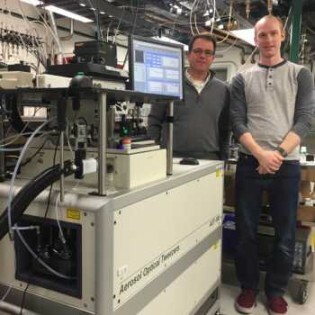 When The Wilson Research Group at the Chemical Sciences Division of Lawrence Berkeley National Laboratory (LBNL) in California became interested in understanding the long-time chemistry of aqueous aerosol in the atmosphere, they chose the Biral Aerosol Optical Tweezers (AOT) equipment to further their pioneering work. Unlike other aerosol instruments that have mostly relied on transits through an illuminated measuring space that last of the order of microseconds, the Biral AOT-100 allows users to hold airborne particles for extended periods with ease. Holding particles in an optical trap enables many different parameters to be studied continuously, over times varying from milliseconds to hours. The Chemical Sciences Division at LBNL is the home of fundamental research in chemistry and chemical engineering. Its work provides a basis for new and improved energy technologies and for understanding and mitigating the environmental impacts of energy use. The division pioneers an integrated research portfolio in fundamental chemistry. Within the division, The Wilson Research Group uses novel mass spectrometric methods and synchrotron based techniques to study organic aerosol oxidation reactions as well as the chemistry occurring at liquid water surfaces. For the group, understanding and quantifying how aerosols are changed during chemical reaction is of key importance for predicting the atmospheric role of aerosols. Single particle confinement using electric fields, acoustic waves, or light, are effective techniques to rigorously explore the microphysical properties of aerosol, and have been effectively applied in numerous studies. The Biral AOT-100 was purchased with the aim of applying a powerful single particle confinement method to explore chemistry initiated by reactive gas and radical uptake. Kevin Wilson, Deputy Director for Science for the Chemical Sciences Division of LBNL, commented “By investing in a commercial product, we were able to take advantage of the significant time and effort put in by researchers at the University of Bristol in its development, giving us access to powerful instrument control and data analysis software, as well as robust and compact hardware. While my group understands the theory underlying optical trapping of particles, we simply do not have the extensive expertise, time or funding to implement all of the hardware and software requirements to make a robust platform for our studies of aerosol chemistry”. The group at LBNL is interested in particular in how physical properties, such as the diffusion coefficient, viscosity and surface tension, vary when aerosol are exposed to reactive gas phase species, such as ozone and OH radicals. Methods exist using the AOT for measuring all these and the group has further developed tools to be applied when studying an aerosol of changing composition. At this stage, the group has published a method for calculating water diffusion in viscous aerosol by measuring the timescale for H2O/D2O isotopic exchange. The next steps in their work are to initiate chemistry in the aerosol, and apply these methods to understand how the diffusion coefficient changes as chemistry occurs. Their key challenges are in-situ¬ production of radical species and then quantifying the extent of chemical reaction, which may be done to a limited extent using the Raman spectroscopic signal. Since taking in the Biral AOT, there has been much interest from fellow scientists, Kevin Wilson adding, “We are often approached by academic colleagues in US Universities who are interested in how the AOT performs and its capabilities”. The Biral AOT offers a step-change in what can be achieved in the measurement of airborne particles. It is a tool that can be used for a very wide variety of research objectives many of which may be novel. The instrument has been designed to provide a range of techniques that have had extensive development and have been shown to be reliable. The components and design of the system offer a high degree of flexibility that should enable the development of new applications. Biral would be pleased to discuss and offer advice on the feasibility of such applications.